I was very pleased to be commissioned for this photoshoot by Homebuilding and Renovating Magazine. The image, published in the latest (April 2016) edition, is of a home in Wells in Somerset undergoing substantial renovation: conversion from a bungalow to a house, with all the upheaval that implies. The weather on the day was pretty grim and the light subdued. Nevertheless, the valiant homeowners - Jackie and Chris - put on smile for the camera and posed cheerfully to complete the shot. I was chosen by the commissioning editor because of my interest in architectural photography and because the image demanded a very large number of pixels, requiring a high quality camera. The photograph needed to exceed the full height of the magazine at 300 dpi – not something a consumer-level camera could approach. The quality will not come across here because the photograph has been printed, rephotographed and then reduced to just 700 pixels (long side) to fit the specifications of this website. So, if you want to see it properly, read the article and enjoy the rest of what the magazine has to offer, you need to go out and buy the magazine! 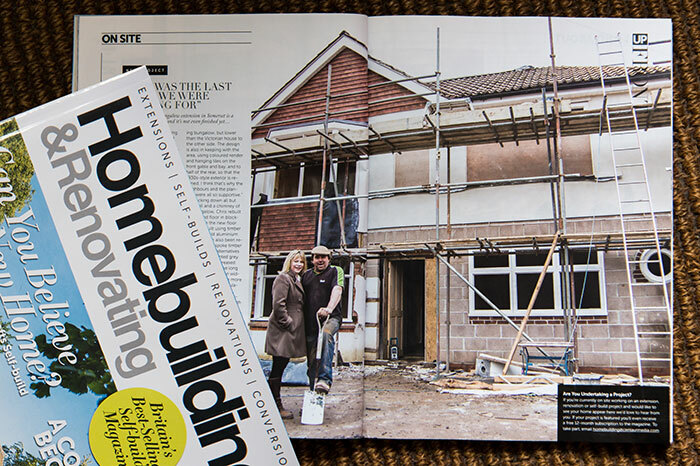 Homebuilding and Renovating Magazine, April 2016. Image by Stephen Riley - Photographer, Somerset.